It was a long and stormy bus ride. Tired of always coming in last in health rankings, a tenacious group of community members from Klamath County, Ore. decided to take action. Years later, Klamath County not only achieved its goal, but it accomplished much more. Thanks to collective efforts to improve health in the county, Klamath won the 2018 Culture of Health Prize. The Robert Wood Johnson Foundation awards the Culture of Health Prize annually to communities actively working on making health a priority. Approximately 200 communities applied for this year’s prize and four communities were chosen, each receiving $25,000. In addition to Klamath County, the three other prize-winning communities were Cicero, Ill., Eatonville, Fla. and San Antonio, Texas. Although Klamath County is surrounded by pristine natural beauty, the predominantly rural county has experienced decades of economic stagnation, in part due to the decline in the timber industry and the Great Recession of 2008. The Klamath Tribes, for which Klamath County is named, have also faced the additional challenge of losing their lands and rights. The county took major steps to addressing health beginning in 2013, when it conducted its first community health assessment. Following that, the county created a community health improvement plan using the MAPP (Mobilizing Action through Planning and Partnerships) process, a free tool designed by the National Association of County and City Health Officials and the Centers for Disease Control and Prevention. By going through the assessment and planning process, the county identified opportunities for improving the health outcomes in their community. Recognizing the dangers of youth tobacco use, Klamath became the fourth county in Oregon to adopt an ordinance around tobacco retail licensing. They also created a rural residency program based out of Klamath Falls, to better improve access to health care for the county’s rural residents. Yet, given their efforts on improving health, applying for the prize was not easy, particularly because many of their efforts seemed miniscule at first and many still saw the county in a negative light — at the bottom of the health rankings. By digging deeper, the county was able to pin down how they were making strides. The Blue Zones Project effort was a key strategy to aid in the implementation of the county’s community health improvement plan. Oregon’s Blue Zones Project (BZP) is an initiative formed to promote and emulate nine lessons learned from the original Blue Zones. 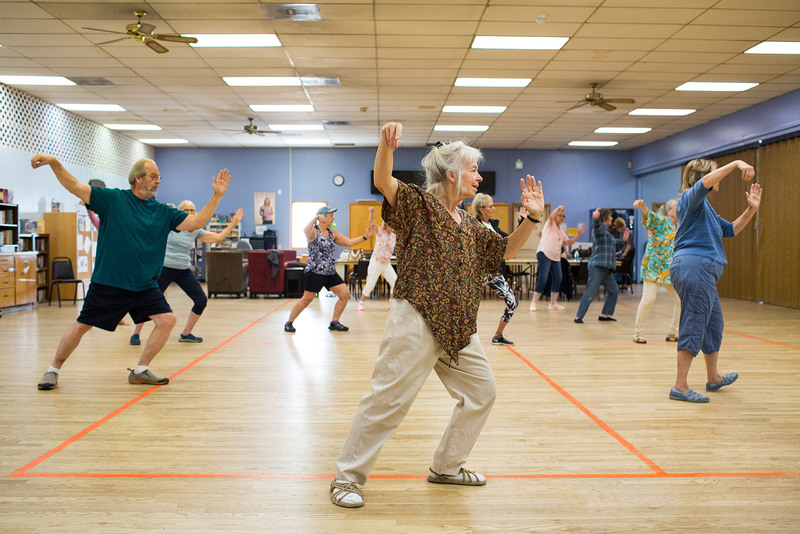 Klamath County became the first Blue Zones Project demonstration community in Oregon. Through the BZP initiative, Klamath County implemented Blue Zones check-out lanes in two of its grocery stores, encouraged restaurants to add Blue Zones items to their menus and worked with 20 employers around efforts on worksite wellness. Another key effort, Klamath Promise, has led to an increase in graduation rates. Klamath Promise worked on motivating students to graduate by bringing motivational speakers from across the country to Klamath County and by awarding more than $30,000 in scholarships to graduates. The scholarships are a way to ensure youth are attaining a quality education, a key social determinant of health. County leadership is also an important part of Klamath County’s health efforts. A key part of achieving changes in policy, such as with tobacco retail licensing, was due to county commissioners’ involvement in ongoing community-wide health efforts. “Having their support has been helpful to moving these initiatives forward,” said Erin Schulten, administrator for the Health Promotion Disease Prevention Program for Klamath County Public Health. Some commissioners serve on steering committees related to these efforts and have even gone a step further by helping bring a grocery store to a food desert and advocating on the state level for an increase in the minimum age for tobacco purchases from ages 18 to 21. Having that political will has helped to propel Klamath County forward on the path to good health. Indeed, winning the prize is a part of Klamath County’s health journey. “Being recognized for our efforts to improve our health outcomes is really exciting, we know our people are our greatest resource and we hope to become known as a community taking health and happiness seriously,” said Kelley Minty Morris, Klamath County commissioner. Recognizing that its work around health will not stop because it received the prize, the county is already planning ways to use the prize money to continue its health efforts. As ambassadors for the prize, they will continue to share their work with individuals and organizations in their community, as well as with others looking to do similar work nationwide. Nyana Quashie is the Health Associate at the National Association of Counties. In this role she will work on health programming that provides information, training and assistance to county officials to promote and support healthy communities.